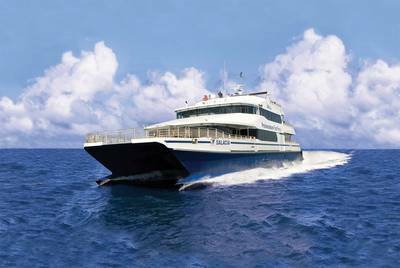 Boston Harbor Cruises’ Provincetown Ferry, the Salacia will be drydocked from January thru March 2015 to undergo a $2.6 million dollar engine refit. Boston Harbor Cruises (BHC) has purchased four MTU 12V4000M64 engines from Stewart & Stevenson. The engines, manufactured by Rolls Royce Power Systems subsidiary MTU, and assembled in Friedrichshafen, Germany, have been completed and successfully tested and are currently on a container ship headed for Boston. According to BHC, the Salacia will be the first EPA Tier III Certified Emissions Level vessel operating in Boston Harbor. The MTU 12V4000M64 engines will reduce diesel emissions, increase efficiency and reliability. The engines are also equipped with ZF reduction gears, which allows the vessel to transfer the torque between the engine and water jet impellers. The refit will last about two months and will take place right in Somerset, Massachusetts at Gladding-Hearn Shipbuilding, where Salacia and BHC’s fleet of eight high speed catamarans were built. Upon completion of the refit, sea trials will begin in March before the Salacia returns for the season. The Salacia is a catamaran that can hold up to 600 passengers. These catamarans are the fastest vessels on the east coast and are able to travel at speeds up to 40 knots, which is faster than most speedboats. The Salacia, also known as Boston Harbor Cruises’ Provincetown Ferry, transports passengers from Long Wharf in Boston to MacMillan Wharf in Provincetown. The vessel’s 7,800 total horsepower quickly takes passengers out to the tip of Cape Cod in just 90-minutes, allowing ample time to enjoy the beach, dining and shopping. Last year the Salacia underwent an extensive $1.5 million interior overhaul. This year the focus is on the engine refit. BHC is excited to complete the total revitalization of the Salacia and is looking forward to the upcoming 2015 season.